�strange things are occurring in a hillside castle surrounded by the warring chaos of power hungry warlords. People are disappearing and the noble Princess Yuki fears for her future. One lone swordsman, Samanosuke heeds the princesses call for help and rushes to her side, only to find she has mysteriously vanished. Outside the fortress walls, enemy troops are attacking the castle and now Samanosuke must stand by his vow to avenge the princess and defeat legion of demon warriors. Following the success on the Playstation 2 of Genma Onimusha, Capcom have decided to re-release this impressive game on the powerful X-Box. The game itself features a plethora of new features that were not on the original PS2 release that definitely sets this apart from the original version. You play the Samurai Samanosuke Akechi who has been given the mission of rescuing the kidnapped princess and vanquishing the powerful demons behind this insideous plot. To aid you in your adventure, a friendly group of Japanese ogres have given you a magical gauntlet that lets you devour the souls of any creatures you kill. This gauntlet lets you collect four different types of energies that regenerate your health, magic and special moves & abilities. What would a hero be without a sidekick? Samanosuke has partner called Kaede, one of the sexiest looking Ninja's around. Equipped with your sword, your magical gauntlet & your sidekick, you are now ready to face the challenges of Genma Onimusha! 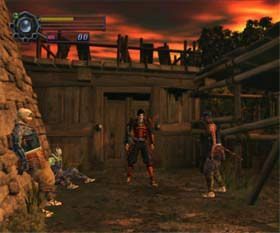 The graphics in Genma Onimusha use beautiful pre-rendered backgrounds that help add to the japanese atmosphere of the game. The polygon count of all characters is fairly high which makes for some very good looking computer animated characters which move very smoothly. The opening cinema of the game is truly remarkable and is probably one of the best looking openings I've ever seen. 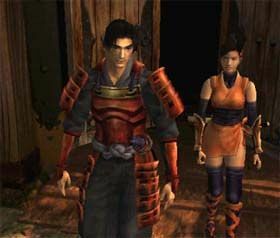 Controls in Genma Onimusha are a little tricky to pick up and you will definitely need a few goes of this game to get the hang of it. This problem is due to the fact that this game is a PS2 port to the X-Box. And as we all know, the X-Box controller is no way near as good as the dual-shock controller. 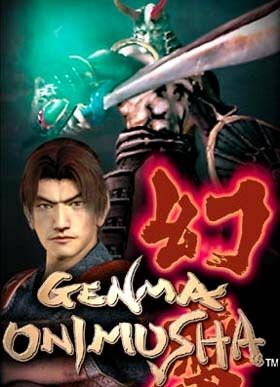 Combat in Genma Onimusha is excellent and sometimes you are fighting five or more demons which makes the gameplay so intense. There are dozens of variations you can do such as blocking, attacking or power moves. Power moves are done by collecting energy for sword, which lets loose a variety of magical forces such as thunder, fire and wind. Genma Onimush is not just another "hack & slash" game, there are dozens of puzzles in the game and in certain areas of the game, you can swap to your partner Kaede, who helps keep the game fresh. Unfortunately she is not as powerful as the main character but she does have some cool moves. The music in this game is truly amazing and uses an orchestral soundtrack that helps set the mood of thie game. Sound effects are used well, although there is nothing new in the X-Box version, they use pre-existing sounds from the PS2. Good but not great. Over all, Genma Onimush is a great game for the X-Box, Highly Recommended!